Hugo Chavez’s death: Like the Soviet Union after Stalin’s death, it will take Venezuelans years to fully understand the legacy of their former strongman’s rule. It will take years for Venezuelans to come to grips with Chávez’s legacy. For a few moments, it must have seemed to those in the room—not just Svetlana but also Lavrenty Beria, the chief of secret police; Nikita Khrushchev, Stalin’s ultimate successor; and Stalin’s henchmen, among them Malenkov, Molotov, Voroshilov—as if the dictator were casting a final curse. And then he died. All present immediately rushed to their cars and sped back to Moscow to begin the bitter and ultimately lethal battle over what would happen next. Mass crowds began to gather in Red Square, and during the chaotic, hysterical funeral, several people were trampled to death. In the heat of the moment, in the eagerness to move forward, Stalin’s longer-term legacy was not examined or discussed. I don’t know what happened in Hugo Chávez’s room when he died, 60 years to the very day after Stalin, though I doubt it was anything quite so dramatic. Chávez wasn’t a mass murderer, after all, though he did do an enormous amount of damage to his country’s judiciary, to its press, to its public life and to its ever more oil-dependent economy. Like the Soviet dictator, he promised the poor of his country things that cannot be delivered—and still they are expected to turn out in vast numbers for his funeral Friday, while his henchmen begin the battle for succession. The more difficult conversation about Chávez’s legacy will be postponed, and indeed will not become clear for many years. In their recent book Why Nations Fail, economists Daron Acemoglu and James Robinson point out, among other things, that the politics and policies of the past, even the very distant past, sometimes cast a very long shadow. They mention the vast gap between the ethnically and culturally identical societies of North and South Korea, and the profound differences between the northern and southern halves of cities that straddle the U.S.-Mexico border. But this same phenomenon can also be seen in some less obvious places. Poles, for example, divide politically along geographic lines that mirror with great precision the divisions of that country between different empires in the 19th century. 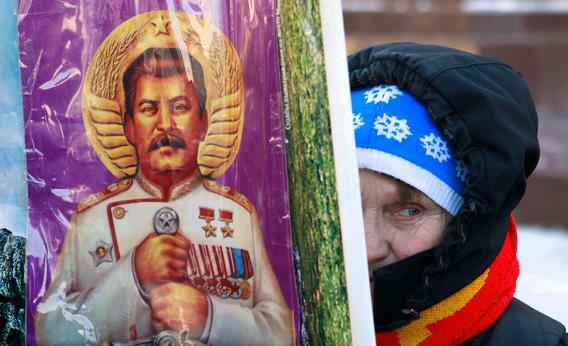 It is in this sense that Stalin and Stalinism also live on, not so much in the current Russian regime, which does not aspire to that level of totalitarian control, but in the cultural habits and attitudes his rule engendered. To this day, the inhabitants of the former Soviet Union are prone to think of the state as predatory and of public officials as distant and unaccountable. They are reluctant, even afraid, to become involved in public life and automatically assume that those who do so are motivated by greed and cynicism. The contempt that post-Soviet leaders sometimes appear to feel for their countrymen is another legacy of Stalin, who believed that “the masses” had to be controlled by propaganda and terror, that their social and economic energy had to be restrained, and that their thoughts and views had to be studiously suppressed. Even in central Europe, which experienced Stalinist rule only in the final few years of the dictator’s life, there remains a paranoid strain in the region’s politics. A small but persistent minority always believes that the nation is ruled by traitors and always assumes that political leaders are somehow being manipulated behind the scenes—as of course they once really were. In that writer’s case, the experience of life under Chávez meant “the dispersal of my family to faraway continents … the persecution and imprisonment of friends and colleagues,” as well as expropriations and violence. Chávez’s impact on him, on his dispersed family, on his children, on his neighbors, on their relations with the state or with public officials, on their attitudes to other countries and to one another, will not end with his death. Both individually and collectively, Venezuelans will spend years trying to understand how he shaped their country’s political culture. The sooner they begin that process, the better.